Two decades of experience of Sathya Sai Baba, mostly very positive, led me to believe that he could have had no part whatever in the six murders that were committed in June 1993. So unquestioning was my faith that I accepted what little was said about it by officials in the Sai movement and in a discourse by Sathya Sai Baba himself some weeks afterwards. One answer to part of the enigma I tried to adopt was that Sathya Sai Baba has to allow human affairs to take their own course so as not to usurp their will. But this would not hold water in the long run. I put them matter behind me... like almost everyone else in the Sai movement. I accepted, in the main, the mostly irrelevant statements he made in the admittedly vague and rambling discourse some weeks later on Guru Purnima day in July 1992. Even some of Dr. Michael Goldstein's emotional outbursts, wrong facts and unbalanced ramblings in his letter to Sai devotees seemed to make things seem somewhat like a divine enigma that we could not hope to understand. (But this ploy was constantly used by Sai Baba to avoid telling or explaining anything that did not suit him). The old excuse, 'only Swami knows the reason' soon clicked in with the followers. But then, I knew virtually nothing about the circumstances at that time, mostly only the carefully contrived bits of Sai Org. 'information' (most cynical disinformation and outright lies, actually). Written instructions were sent out by leaders of the Sathya Sai Organisation (eg. Indulal Shah, Central Office and Michael Goldstein) not to question or discuss anything about the incident, but to ignore it and rather concentrate on oneself and one's own spiritual practice (i.e, based on the same principle as ever, namely: God does only what is good, any bad is done by us)! This is all very well, if you care nothing for the victims, the truth of the matter, justice or if one accepts the clumsy and despicable cover-up attempted by the ashram, the police, the Andhra Pradesh State authorities and top devotees of Indian Government (in the person of then Home Minister of the Indian Government, S.B. Chavan - backed by the Prime Minister, Narasimha Rao)). In 1995, at the 70th birthday celebrations, I began to hear about the whole episode from an Indian Administrative Service Vigilance Officer, Mr. V. Ramnath, who told me that his close colleague had been personally involved in the early investigations of the temple complex after the murders. The entire account was so shocking and so many confusing points remained unanswered that it seemed impossible to evaluate what was false witness and what genuine, and to piece together the evidence so as to see who might be responsible and what motives the various involved persons could have had. I set about getting inside information from persons whose judgement and honesty I could really trust. This I collated with the many press reports. The Indian press repeatedly described events, as best they were able to investigate them through eye-witnesses who were too frightened to stand forth with their names. Literally hundreds of articles were written in all as the press tried to do its duty to society. Sathya Sai Baba rubbished the entire press coverage and the journalists involved in his highly evasive 1993 Guru Purnima discourse, without explaining a single thing. However, he stated that the whole incident would only serve to increase his fame throughout the world! (Perhaps he was thinking of 'notoriety'). The complaint to the Press Council by the AP journalists' union had no appreciable effect. Sathya Sai Baba explained nothing that did not suit him, and that was very little, devious and confusing (see here). Eventually the invaluable book by B. Premanand (Murders in Sai Baba's Bedroom) provided a mass of documentary transcripts and other evidence which helped me to understand how massive and the cover-up to protect Sathya Sai Baba and his brother was. It was successful too, in that it averted the collapse of Sai Baba's reputation among the large majority of his following. The burial of the entire case by government action kept the matter mostly out of the world media and it soon ceased to be discussed or written about, not least because powerful authorities caused the Indian press thereafter to suppress all criticism of Sai Baba, with but a few small exceptions. One such exception was The Dalit Voice 19-7-1993, which printed: "This is what journalists covering the Sai Baba affair here tell us. And that should once and for all convince us that in India there is nothing like ‘freedom of the press’. Every journalist who had been to Puttaparthi knows the truth but he/she is under orders not to write. Hence it becomes our duty to reveal the truth. What is the truth? According to the visiting BBC correspondent, Jaswinder Singh’s on-the-spot reporting from Puttaparthi, the four alleged assassins were not killed by the police, but by Baba’s own people. The BBC had quoted the mother of one of the dead ‘assassins’ now living in the Puttaparthi ashram itself. She was quoted that her son was for long fearing murder and he was finally killed. The events of the disastrous night During the hours that passed while the four intruders who had killed Sathya Sai Baba's two attendants were locked in his apartment, various persons reportedly visited Sathya Sai Baba in the garage annex to the temple. 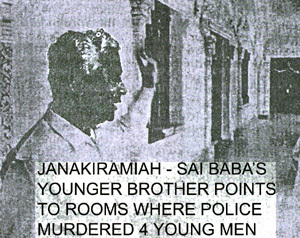 Witnesses reported seeing his younger brother Janakiramiah, Joga Rao visit Sathya Sai there a few times and also exit not long before the shots from police rifles were heard by many residents and visitors. Were Janakiramiah, Colonel Joga Rao and Sathya Sai Baba just discussing the weather, or maybe Sathya Sai Baba was further repeating his compassionate teaching, 'Help ever, harm never' and "See no evil, hear no evil, do no evil"? They were never even questioned about any of this, which is itself remarkable. The cover-up was evidently engineered at the highest levels of the land. The Hindu, Coimbatore 18-6-1993 wrote: "A common question everybody asks is why have the police and the investigating agencies have not ventured to examine the prime witness, Satya Sai Baba himself, even after 11 days have passed. When press persons posed this question to the Union Home Minister, Mr. S.B. Chavan, he merely said that the officers had not felt the need and that if at any stage of the investigation it was found necessary, the Baba would certainly be interrogated. Another intriguing aspect is that the Satya Sai Central Trust, which runs the ashram, has not yet filed a written complaint." In 1994, I was informed by an elderly and devoted Bangalore businessman, Mr. Singaravelu, a contractor who worked on the hall at Brindavan and whose close relative and ashram resident he claimed was there at the time, that Sathya Sai Baba was standing for some time behind the Prashanti temple where some women devotees and a number of students who had heard the alarm ring in the police station arrived. The police staggered drunkenly onto the scene across the ashram wall only after a very long time. However, other reports stated that Baba went along the first floor balcony to a room near or within the garage annex where he remained until the whole incident was over. In 2012, however, a well-placed eyewitness - Eileen Weed known as Divya - living with Sai Baba's sister Venkamma overlooking the temple denied that Sai Baba was to be seen outside the rear of the temple. Instead, she understood he had left his room and moved out to another on the second floor at the opposite end of the temple (adjacent to the garage complex). This was also stated in numerous newspaper accounts by on-the-spot newsmen who interviewed a wide range of those present during the fateful events. In the light of official documents alone, no one can seriously contest that the killing spree by police was followed by a totally botched police cover-up. It would have made truly divine comedy directed by a humorous God from on high... were it not for the fact that two attendants (including his personal valet Radhakrishnan) were murdered and four servants of Sathya Sai Baba, who had been most devoted for many years, were killed in "the holy of holies", the Prashanthi Nilayam temple (in the "Abode of Supreme Peace"). The police were blackmailed by Baba's younger brother Janakiramiah (then to become his right-hand man on the Sathya Sai Central Trust) also with the aid of other ashram and Trust officials. This is the truth as it was told to me by V. K. Narasimhan who was party to some of the the discussions between those involved afterwards. Those who want a fuller account of how the crucial facts were made known to me by V.K. Narasimhan (which facts I could for the sake of his own security not make known until after his decease - see my account here and notes I made after discussions with him here and here). As the undisputed ruler of Prashanthi Nilayam township and of his servitors and devotees who dare not go against his commands, Sathya Sai Baba must bear the overall responsibility for all of it, not least since he indicated in his discourse weeks after the event that he knew in advance the fate of his servitors and warned them too! Nothing can absolve him from having been complicit in cold-blooded murder. Amusingly, he repeatedly denied that human beings have any kind of 'free will' and that 'only God (he means himself) has free will'. Though this alone literally amounts to his own self-condemnation, I do not accept this indefensible primitive doctrine and only blinded or indoctrinated devotees could manage to swallow it. Besides, he also stated that human beings have some measure of free will and that they can choose between good and evil acts. Typical of his catch-all menu and self-contradictions. See Sai Baba 1993 murders: eyewitness reveals amazing facts, Sathya Sai Baba reported to have ordered executions! and Sathya Sai Baba massive bribery of residents.